This recipe is based on a Hairy Dieters recipe, that has been adapted to be gluten free, and also give a bit more oomph! to the bread coating. Very tasty and only about 300 calories per portion. Serves two but can easily be doubled up. Place the bread on a large baking tray lined with baking parchment and toast until pale golden brown. Leave to cool for 5 minutes, and tear the bread into large pieces. Put half the bread in a food processor and blitz into crumbs. Tip these into a large bowl and toss with the oregano, paprika, (and chilli, if used) , salt and Parmesan cheese then season with lots of black pepper. 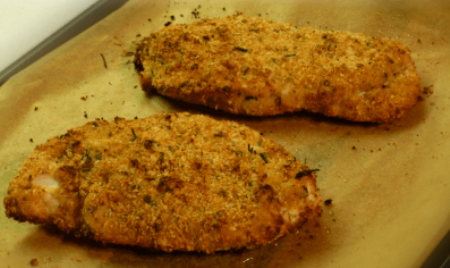 Put the crumb mixture on a dinner plate. Spoon the yoghurt into a bowl and sprinkle the flour on another dinner plate. Put the chicken breasts between two sheets of cling film and flatten them a little by tapping them with a rolling pin - don't hit them too hard otherwise you can pulverise them and end up with chicken paste! Take a chicken breast and coat it lightly in the flour, shaking off any excess, then dip it into the yoghurt until evenly covered. Transfer the chicken carefully to the lined baking tray. Bake the chicken for 22-25 minutes until golden, crisp and cooked through. Leave to stand for 4-5 minutes before serving with some fresh green salad.